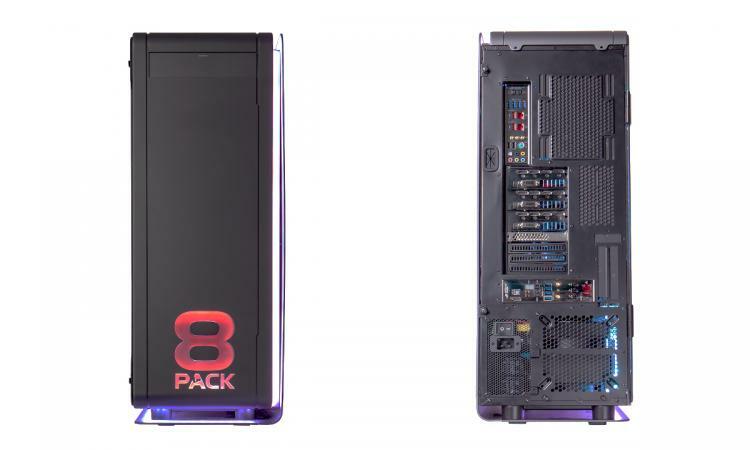 OverclockersUK are today launching their most ambitious desktop PC solution ever: the 8Pack OrionX. Comprised of components where the label 'Top Quality' would be a cruel understatement, the OrionX is two systems in one chassis either of which would rank among the best performing PCs in your home or workplace. With performance projected to be off the chart, and complementary internal water cooling, the OrionX is for those who demand the very best. Twice over. First up is the main system, powered by and Intel Core i7-6950X guaranteed to be clocked at a minimum of 4.4GHz. Ten CPU cores, each with hyperthreading, will let it chew through multithreaded tasks without blinking at a rate unrivalled by other enthusiast-class solutions. The backbone of the system is an Asus Rampage V ED 10 Intel X99, whilst the memory is a set of eight premium 8GB Corsair Dominator Platinum 2666MHz DIMMs (for 64GB in total). Storage also gets the 8Pack performance treatment thanks to two Samsung 950Pro 1TB SSDs in RAID 0 to go alongside a single Intel 720 1.2TB NVMe SSD. Oh, and if you needed more capacious mechanical storage, the 10TB Seagate Barracuda HDD should do nicely. By utilising the X99 platform OCUK and the 8Pack systems design team have been able to integrate three GPUs, but not just any GPUs - a triplet of watercooled NVIDIA Titan X Pascal GPUs overclocked beyond 2GHz. Should even that prove not to be sufficient a quad-SLI option is available, pushing the performance even further. 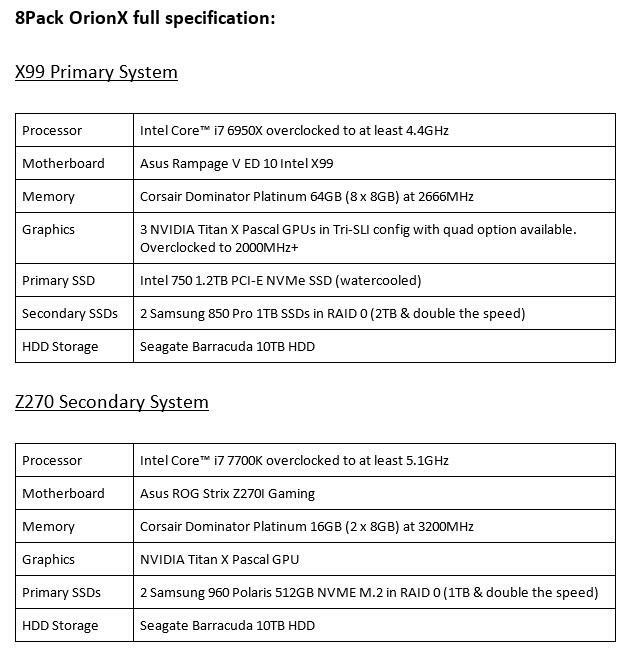 It goes without saying that this is a vastly more than capable gaming rig; heck, you could probably sell time on it to a local University due to its number-crunching capabilities alone. With all of its glorious hardware, puts out a ton of heat so we needed the best of the best water cooling hardware to match the level of the insane specification. We wanted each system's main components to have separate water cooling loops so as to be able to dynamically control the fans and pumps on each loop to keep noise down and temperatures fully in check. Ensuring that load on one loop did not affect the other hardware's cooling capacity and hence stability. This is what inspired the three loop design. 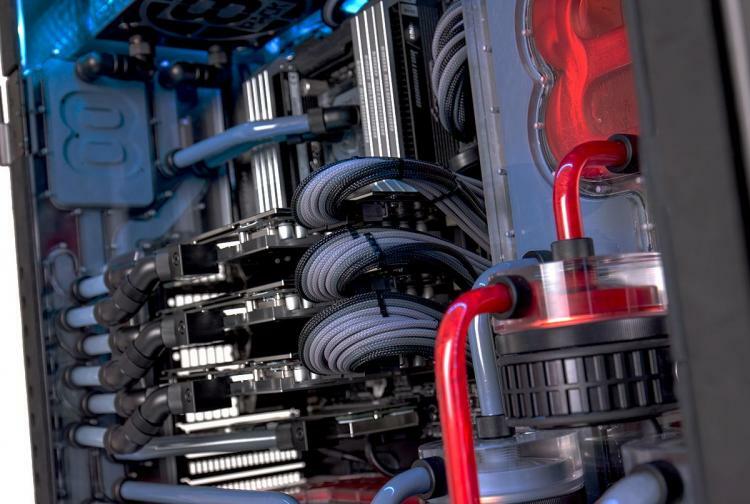 Optimum cooling for all hardware and ultimate control. To connect up these loops we knew we would have to do some pretty insane tubing. But it was our idea inspired by the 8Pack Asteroid PC but this time - to a much more ambitious level - we would use pass-through plates made from polished acrylic to route the fluid around the walls and mid-plate of the case. Within these pass-through plates the fluid travels on several levels to create the ultimate look when illuminated. We have also added branding to the plates with the CPU loop travelling through an 8Pack logo in the IO side of the case and the ITX system fluid passing through an 8Pack logo which has been incorporated into the front of the case. The IO side of the case has never been used to carry fluid this way in any retail PC before. We have gone a step further, straight out of the gate by having a two layer pass-through allowing the GPU loop to run above the CPU loop. The GPU's being fed from the side instead of the usual underneath and the liquid appearing to zigzag across them. So, that's one system, but how about the second? The chassis chosen features spots for both a full ATX system and a mini-ITX companion, and the OrionX takes this concept and runs with it. Sporting an Intel Z270 motherboard and 7th Generation 'Kaby Lake' Core i7-7700K 'Golden Chip', its been overclocked to a minimum of 5.1GHz. This platform is partnered with another NVIDIA Titan X Pascal GPU (the OrionX's 4th, for those counting at home), and also incorporates two Samsung 950Pro 1TB M.2 SSDs in Raid 0. The overall configuration of the OrionX is made possible by the Phanteks Enthoo Elite, a chassis which can house both a ATX system mounted vertically and a mini-ITX system horizontally without restricting severely restricting component choice. Also key was a PSU that can handle both systems simultaneously in addition to the complex watercooling: a Super Flower Leadex ‘8Pack Edition’ 2000W PSU. So, what's the price of this level of computing power? Well, are you sitting down? Good. It's £23,999 (inc. V.A.T.). 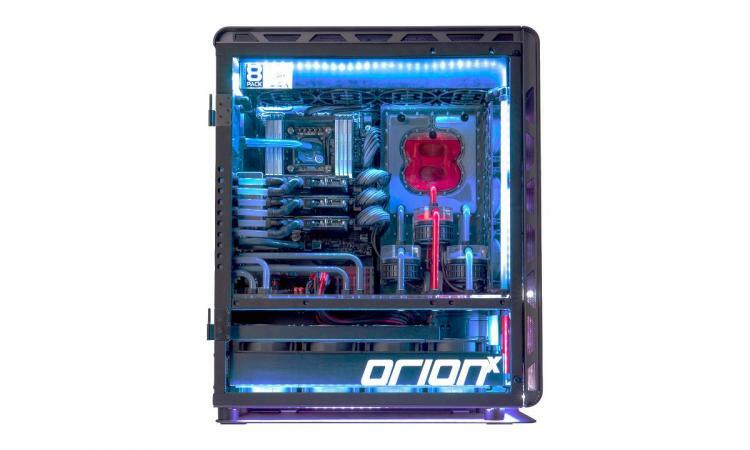 Okay, so that's a lot of cash, but it's also a hell of a lot of computing power and premium enthusiast-grade components in two individual systems, not to mention the bespoke water cooling and expertise necessary to build it. The 8Pack OrionX is the sort of system that few people will ever require, but those who do will currently have their eyes alight and be frantic to hit the product page; the rest of us can just sit back and marvel at the engineering (and bank balance) that goes into each one. 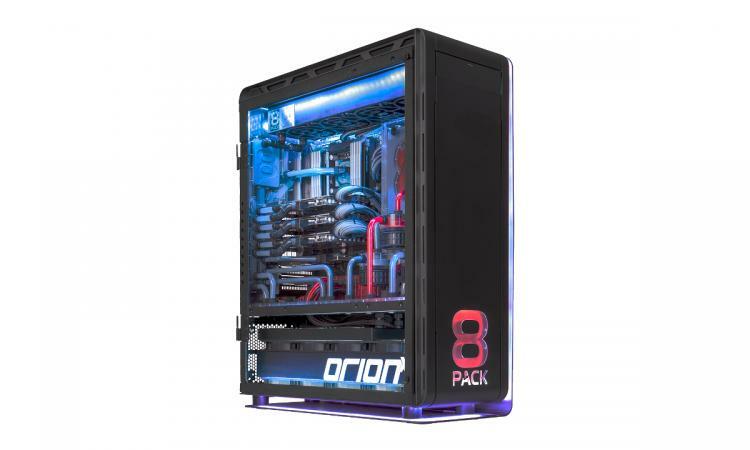 If you're looking to see more information on the 8Pack OrionX visit OCUK's dedicated landing page at overclockers.co.uk/orionx. As with all other OCUK systems the 8Pack OrionX is configurable to a variety of needs, whilst a bevy of other less demanding solutions are available throughout their range.